Breakfast in Bed Gift Box for sale. Buy online at Zingerman's Mail Order. Gourmet Gifts. Food Gifts. 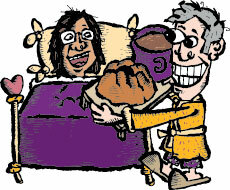 Breakfast in bed can be the pinnacle of romance. The problem is it's often better in theory than practice. How do you keep them in bed for so long while you busy yourself in the kitchen and keep it all a surprise? With this gift box, you can keep the romance, your relationship and the fun alive—and in a timely fashion. Many of the treats inside take little to no preparation, simply open and serve. Lay out a spread for your lover to enjoy with the paper while you put the finishing touches on the meal. With the smallest of efforts, you'll be reaping the rewards of your romantic mind for many mornings to come. Includes a Chocolate Chunk Banana Bread, a Currant Scone and an orange and almond Bostock, a bag of Zingerman's High Flyer Coffee, a dangerous portion of Spanish Hot Chocolate, and Nueske's Applewood Smoked Bacon, just for good measure.